Heel Spur/Calcaneal Spur is one of the most common causes of heel pain. Continued overstrain of plantar fascia results in stripping of periosteum from its origin at the calcaneus. The gap thus formed is filled by the proliferation of bone resulting in formation of a bony spur to secure the detached attachment. Thus calcaneal spur is a late sequale of plantar fascitis. Heel spurs and plantar fasciitis can occur alone or be related to underlying diseases which cause arthritis (inflammation of the joints) such as Reiter's disease, ankylosing spondylitis, and diffuse idiopathic skeletal hyperostosis. The calcaneal spur may not be always painful. When painful a sharp, stabbing pain under or on the inside of the heel. The pain is typically relieved during rest, but is worse after getting up again. As a rule of thumb, it is most painful first thing in the morning. The pain is made worse by walking on a hard surface or carrying something heavy, such as a suitcase. The pain can become so severe that it becomes difficult to continue your daily work. 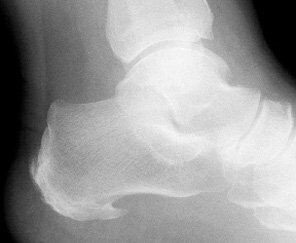 Heel bone spurs can be diagnosed with an X-ray foot where a bony outgrowth can be seen at the calcaneal bone near the attachment of plantar fascia. Radiological proof helps exclude other conditions like arthritis, stress fractures etc. Once formed, this spur is permanent and attempts to remove it results in its recurrence. Rest: The intensity and duration of activity and weight bearing should be reduced. Staying off the feet can help a lot ( For example- heel raise walking while getting down from bed in morning or after long sitting ). Relieve pain and inflammation: Use of ultrasound and contrast bath help reduce pain and inflammation. Avoid walking barefoot: Shoes are a must to support the arch of the foot even when at home. Arch Supports and heel cups cushion to the heel, and reduce the weight bearing on the foot during activities. Stimulation: Faradism can be an effective measure to induce contractions in the intrinsic muscles improving their tone, power and circulation. Exercises: The workout regimen should consist of mild stretches for strengthening of foot and calf muscles so as to reduce the tension on the heel mechanically. Exercises to the intrinsic muscles in warm water in the morning before initiating weight bearing. Strengthening exercises to the intrinsic muscles as sustained toe curling, performed even with shoes on provide an excellent technique of resistive exercises. Resting on lateral border of the foot with cupping of the foot by curling of toes is effective in moulding longitudinal arch. Weight loss: Losing weight can reduce the extra pressure that plantar fascia bears with every step. Medications: Pain Relief Medications like analgesics and anti-inflammatory are advisable in acute as well as chronic cases. For chronic heel pain management or surgical advice consult a podiatrist. Steroids and anesthetic injectables at the site of spur may be advised in severe ceases.